One thing is certain about Thomas Christian historiography in the Portuguese period: its hotly contested debates are far from new. The first printed reports of the Synod of Diamper were published in Coimbra, Portugal, in 1606: the first, a reproduction of the resolutions passed in the Synod, the second, an account of the activities of Alexis de Menezes, Archbishop of Goa and driving force behind the Synod. In the space of three years, this second work, known as the Jornada, had been translated into French and Spanish. The title of the French translation of Gouvea’s work (1609) captures how many members of the Catholic religious orders, and particularly the Jesuits, interpreted the Synod: Histoire Orientale des Grands Progrès de l’Église Catholique Apostolique et Romaine en la réduction des anciens Chrétiens, dits de S. Thomas, de plusieurs autres Schismatiques et Hérétiques a l’union de la vraie Église. The Union Synod was seen through the lens of the previous century: there was a deep sense of loss among many Catholics after the Protestant Reformation, which had taken much of Northern Europe out of the Roman Catholic sphere. An untied “Christendom,” coterminous with “Europe,” was no more. In some small way, God and His servants the Portuguese had begun to fill the void created by the Protestant Reformation. According to Hierosme Verdussun, the Flemish Jesuit who had translated the Jornada into French, the Synod was a “great progress” on the road to making the Catholic Church truly catholic (that is, ecumenical). Two views of Portuguese-Thomas Christian relations in the sixteenth century. 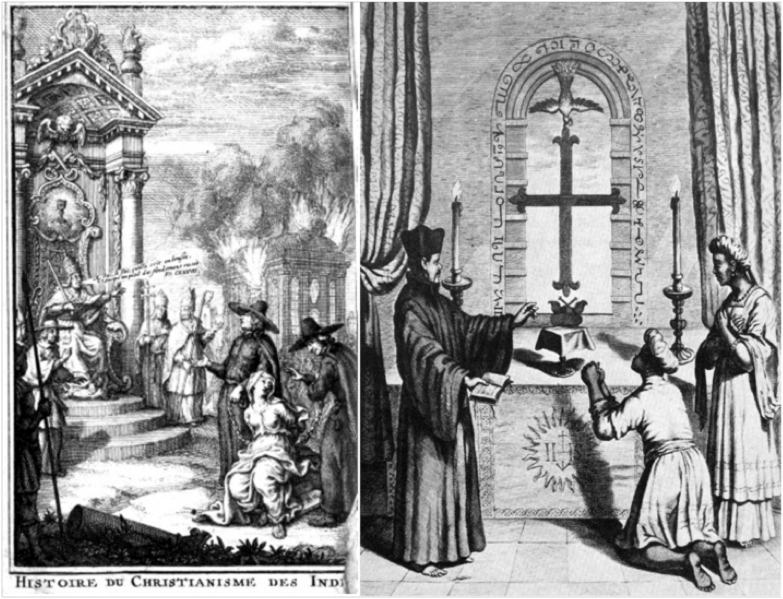 On the right is the frontispiece of Marthurin Veyssière de Lacroze’s Histoire de christianisme des Indes. The illustration on the right is from Athanasius Kircher’s China Illustratus. As one might expect, Protestant writers in the seventeenth and eighteenth centuries saw the Synod in a different light. In 1694, Michael Geddes, Anglican bishop of Salisbury, translated parts of Gouvea’s Jornada into English. The complete title of his work unequivocally states Geddes’ purpose and bias: The History of the Church of Malabar, From the Time of its being first discovered by the Portuguese in the Year 1501. Giving an Account of the Persecutions and Violent Methods of the Roman Prelates, to Reduce them to the Subjection of the Church of Rome Together with the Synod of Diamper, Celebrated in the Year of Our Lord 1599. With Some Remarks Upon the Faith and Doctrine of the Christians of St. Thomas in the Indies, agreeing with the Church of England, in Opposition to That of Rome (London: Prince’s-Arms in St. Paul’s Churchyard, 1694). In the long and polemic preface, Geddes outlined the cruelty of the Portuguese toward the Thomas Christians. From the bishop’s perspective, the Thomas Christians had retained a simplistic form of Christianity devoid of Roman artifice due to their geographic separation from the rest of Christianity. During the period, Protestants of all stripes, not just Geddes, wanted to associate themselves with the beliefs and practices of Primitive Christians, for they had not been tainted by Catholic “inventions” which had no basis in the gospels. It was thus but a small leap for Geddes to assert that Thomas Christians, both as living fossils of early Christianity and victims of Roman Catholic depravity, were analogous to Protestants. In total, Geddes provides a list of 26 commonalities (64). To make his argument, however, Geddes had to elide over the fact that many Thomas Christians had accepted Portuguese Catholic instruction long before Diamper, even sending their sons to become Catholic priests as early as 1528. A quarter-century later (1724), Marthurin Veyssière de Lacroze, head librarian of the Prussian Royal Library, also set out to set the record straight by refuting the only other work on the Synod of Diamper in French—Verdussun’s Histoire Orientale. Though Lacroze states in the introduction of his Histoire de Christianisme des Indes that he was unaware of Geddes’ book until after the manuscript had been sent to the publishing house, his estimation of the Thomas Christians and the Portuguese is identical. In short, over the last four centuries the history of Christianity in India has been used by some scholars to support their religious claims about the “true” religion and discredit their religious foes in contexts outside of India. Like looking at a Rorschach inkblot test, those who have wanted to prove the “rightness” or “wrongness” of the Synod of Diamper have seen what they wanted. Neverhteless, religious affairs alone are not sufficient to explain the evolution of Portuguese-Thomas Christians relations. There were two other major developments that influenced Portuguese perceptions of the Thomas Christians. One was the new relationship between the Portuguese empire and the Apostle Thomas. The second was the pepper trade. Black pepper, the variety most prized in Europe, was the stock-in-trade of the Portuguese empire in the east in the sixteenth century, and it was grown in only one place—the foothills of the Western Ghats, the area known to the Portuguese as the Serra, where the Thomas Christian population was thickest. Though they were not monopolists of the pepper trade, the Thomas Christians of the Serra did monopolize pepper production. The following posts will have much more to say about pepper, Thomas Christians as pepper producers, and their namesake, the Apostle Thomas. Una cosa es cierta sobre la historiografía de los cristianos de Tomás en el periodo portugués: sus intensos debates tan están lejos de ser nuevos. Los primeros registros impresos del sínodo de Diamper fueron hechos en Coimbra, Portugal, en 1606. El primero fue una reproducción de los acuerdos del sínodo; el segundo fue un recuento de las actividades de Alexis Menezes, el arzobispo de Goa, quien fue el motor detrás del sínodo. En un lapso de tres años, este segundo trabajo, conocido como la Jornada, había sido traducido al francés y al castellano. El título de la traducción francesa de la obra de Gouvea (1609) capta cómo muchos miembros de las órdenes religiosas católicas, y en particular los jesuitas, interpretaron el sínodo: Histoire Orientale des Grands Progrès de l’Église Catholique Apostolique et Romaine en la réduction des anciens Chrétiens, dits de S. Thomas, de plusieurs autres Schismatiques et Hérétiques a l’union de la vraie Église. El sínodo de la unión fue visto con ojos del siglo anterior: había un profundo sentimiento de pérdida entre muchos católicos después de que la reforma protestante arrebatara de la esfera católico-romana la mayor parte del norte de Europa: una “cristiandad” unida, superimpuesta a “Europa”, no existía más. De una forma no insignificante, dios y sus sirvientes, los portugueses, habían comenzado a llenar el vacío creado por la reforma protestante. Según Hierosme Verdussun, el jesuita flamenco que tradujo la Jornada al francés, el sínodo, en efecto, fue un “gran progreso” en el camino para hacer a la iglesia católica verdaderamente católica (eso es, ecuménica). Dos perspectivas de la relación entre portugueses y cristianos de Tomás en el siglo XVI. A la derecha, una imagen de la Histoire de christianisme des Indes de Marthurin Veyssière de Lacroze; a la izquierda una ilustración del China Illustratus de Athanasius Kircher. Como puede esperarse, en los siglos XVII y XVIII los escritores protestantes vieron el sínodo desde una perspectiva distinta. En 1694, Michael Geddes, el obispo anglicano de Salisbury tradujo partes de la Jornada de Gouvea. El título completo de su obra afirma inequívocamente el propósito y el sesgo de Geddes: The History of the Church of Malabar, From the Time of its being first discovered by the Portuguese in the Year 1501. Giving an Account of the Persecutions and Violent Methods of the Roman Prelates, to Reduce them to the Subjection of the Church of Rome Together with the Synod of Diamper, Celebrated in the Year of Our Lord 1599. With Some Remarks Upon the Faith and Doctrine of the Christians of St. Thomas in the Indies, agreeing with the Church of England, in Opposition to That of Rome (London: Prince’s-Arms in St. Paul’s Churchyard, 1694). En el largo y polémico prefacio de esta obra, Geddes hizo una descripción de la crueldad de los portugueses hacia los cristianos de Tomás. Según el obispo anglicano, los cristianos de Tomás habían retenido una forma simple de cristiandad, libre de los artificios romanos, debido a su distancia geográfica con Roma. Durante este periodo, protestantes de todo tipo, no sólo Geddes, quisieron asociarse con los cristianos primitivos, cuyas prácticas y creencias no habían sido todavía manchadas por ningún dogma “católico”, el cual, según los escépticos, no tenía ninguna base en los evangelios. Para Geddes, entonces, afirmar que los cristianos de Tomás, como fósiles vivientes de la temprana cristiandad, eran análogos a los protestantes, implicaba sólo un pequeño paso. En conjunto, Geddes ofrece una lista de 26 puntos en común entre ambas tradiciones (64). Todavía más, protestantes ingleses y sirio-malabares se encontraban vinculados porque ambos habían sido víctimas de un opresor común: los católicos romanos. Para elaborar este argumento, sin embargo, Geddes tuvo que omitir el hecho de que muchos cristianos de Tomás habían aceptado por voluntad propia la instrucción de los católicos portugueses mucho antes de Diamper e incluso habían enviado a sus hijos para que fueran ordenados sacerdotes católicos en fecha tan temprana como 1528. Un cuarto de siglo después, Marthurin Veyssière de Lacroze, principal bibliotecario de la biblioteca real prusiana, también se dispuso a poner las cosas en claro. En su Histoire de christianisme des Indes (1724), Lacroze buscó refutar la obra previa sobre el sínodo de Diamper en francés, la Histoire Orientale, de Verdussun. Aunque Lacroze afirma en la introducción que no supo del libro de Geddes hasta después de que su propio manuscrito había sido mandando a la prensa, su evaluación de los cristianos de Tomás y los portugueses es casi idéntica. En suma, en los últimos cuatro siglos la historia de la cristiandad en la India ha sido usada por algunos eruditos y académicos para apoyar sus reivindicaciones religiosas sobre la “verdadera” religión y desacreditar a sus adversarios religiosos en contextos fuera de la India. Como cuando se mira la mancha de tinta de la prueba de Rorschach, aquellos que han querido probar el carácter “justo y verdadero” o, por el contrario, “injusto y falso” del sínodo de Diamper han visto lo que han querido ver. Sin embargo, los asuntos religiosos por sí mismos no son suficientes para explicar la evolución de la relación entre portugueses y cristianos de Tomás. Hubo otros dos grandes desarrollos que influyeron la percepción portuguesa sobre los cristianos de Tomás. Uno fue la nueva relación entre el imperio portugués y el apóstol Tomás. El segundo fue el comercio de pimienta. La pimienta negra, la variedad más apreciada en Europa, fue el recurso más importante del imperio portugués en el oriente durante el siglo XVI, y sólo se daba en un solo lugar: las estribaciones de los ghats occidentales, el área conocida por los portugueses como la Serra, en donde la población de cristianos de Tomás era más abundante. Aunque no monopolizaba el comercio de la pimienta en el siglo XVI, los cristianos de Tomás de la Serra sí tenían el monopolio de su producción. Las siguientes entradas tendrán mucho más que decir sobre la pimienta, los cristianos de Tomás como productores de pimienta y el personaje asociado con su nombre, el apóstol Tomás.